Is LA Big Enough For Lebron James AND LaVar Ball? Is Los Angeles big enough for the two of them? It seems like we can’t go more than a few days without a story about the possibility of Lebron James joining the Los Angeles Lakers next season as a free agent. As the story goes, he has houses here, the entertainment business is here, and winning a title with a third team in LA will add to his legacy, yada yada yada. And though not a good team, we’re told the Lakers will also sign Paul George and make other moves to make the team more championship ready for the King. Setting aside the fact that the Lakers would still have ground to gain on other loaded western conference teams, and LBJ would be giving up his eastern conference gravy train to the finals (although Boston is a coming), there is one little factoid not being talked about. The side-show that is LaVar Ball. Why on Earth would LBJ want to subject himself to that? Oh, maybe LaVar will promise Lebron he’ll slide into the background if he signs with the Lakers. You know, like how Ball promised Magic Johnson. We see how that has worked out. This man is quiet for n-o-b-o-d-y. Who is LaVar going to blame if things are going badly? Right now it’s Coach Luke Walton. Maybe it will continue to be Walton or whoever else might replace him at some point. But what if Ball started blaming James? What if Ball jumps on the bandwagon of James’ critics, and questions James for his leadership? Ability to close a game? Clutch foul shooting? Or infers that any of these thoughts are coming from the team? Again I ask, why on Earth would Lebron want expose himself to the LaVar Ball circus? James has legitimate critics out there, but Ball, if history were to hold to form, would not be one of them. But he might get more attention for it than any of them. Walton doesn’t deserve L. Balls yapping now, and James certainly wouldn’t deserve it later. I mentioned the word legacy in the first paragraph. In case you haven’t noticed legacy is something that is important to Lebron. See how Lebron clapped back at Charles Barkley when Barkley made unflattering comments about him. Lebron wasn’t going to let Sir Charles “disrespect his legacy”. Nor was LBJ going to stand for it when Phil Jackson referred to his inner circle as “his posse”. 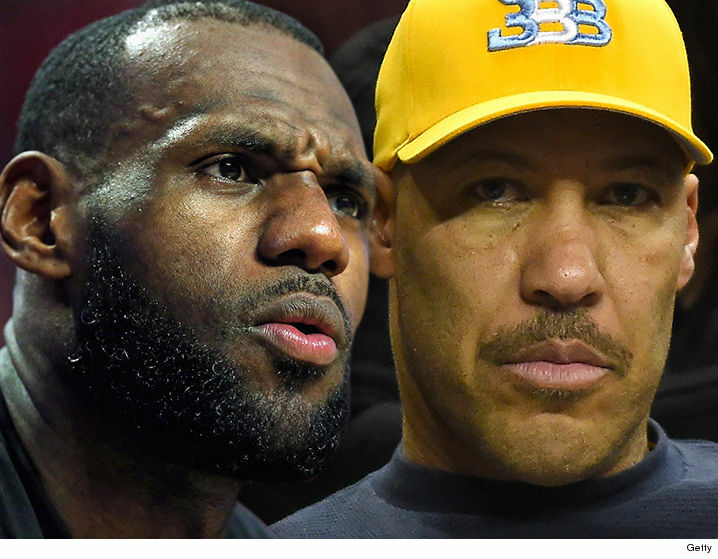 Further, LaVar has already irritated Lebron with his comments about Lebron’s children. James was well justified in response. And what if Lebron comes to the Lakers and they win? When Lebron has won in Cleveland and Miami, a majority of the credit and adulation went to him. It might be if he were to win in LA but that doesn’t mean LaVar wouldn’t tweet anything in his power to take away props and attention from Lebron, diminish his contribution and credit himself (and maybe Lonzo) for being the one to “talk it into existence” and whatever else he can come up with. LBJ can stay with the Cleveland Cavaliers who have a high number one pick on the way, or join a loaded Houston Rockets team with good friend Chris Paul. Those seem like far better options. If Lebron does want to go to the Lakers or at least explore it, I can see him going to Magic behind close doors and saying, you want me? Trade Lonzo Ball. If the Lakers did trade Lonzo in order to sign Lebron it would probably ignite a twitter sh*t storm from LaVar directed toward James. This could actually be a good thing for James as it could provide cover for him for leaving Cleveland again. Cleveland fans could be burning jerseys, rioting, (I don’t think Cleveland’s reaction would be nearly as strong the second time around.) but the media wouldn’t care because when LaVar talks they lap it up like a dog drinking from a toilet bowl on an Arizona summer day. Many would jump to Lebron’s defense and by the time the storm died down it would be like oh yeah, Lebron left Cleveland again. Like they used to say in the old westerns… This town ain’t big enough for the both of them. Lebron, free advice: If Lonzo is still with the Lakers, don’t do it. This entry was posted in Basketball and tagged Basketball, Jeff Schubert, Lavar Ball, Lebron James, Los Angeles Lakers, NBA. Bookmark the permalink.